The mining world of Hervara is beset by war, ravaged by the conflict between the Severan Dominate and the Imperium of Mankind. Planetfall - The squad's arrival on Hervara is not a quiet one. However, the havoc of their landing uncovers an ancient secret capable of changing the fate of the war against the secessionists. The Night Path - Separated from their own regiment, the squad must learn to work alongside the new allies as they execute a number of critical strikes for control of key assets on Hervara. The Horn of Mars - Beset on all sides by their foes, the squad's only path to survival leads them to one of the grandest and most powerful Imperial weapons ever constructed: The Ordinatus. Fight to survive the blast of war and decide the destiny of Hervara! 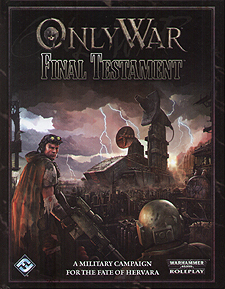 A copy of the Only War Core Rulebook is needed to use this supplement.